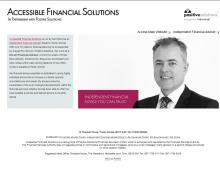 AFSIFA is run by Karl Ward an Independent financial advisor based in Poole, Dorset. Karl Ward works as an IFA in Bournemouth & Poole and is supported by a large IFA network called 'Positive Solutions Ltd', who are authorised and regulated by the Financial Services Authority. Karl Ward offers independent financial advice to assist clients with their financial needs from products available across the whole of the market. Karl’s face to face professional advice is tailored specifically to each client’s requirements and needs. Karl has an understanding of the ever changing financial services industry and offers his bespoke IFA advice to find his clients the most suitable products available. Karl offers advice on short, medium and long term goals and strategies to ensure his clients are given the best IFA advice offering solutions and variables to clients needs. This Dorset financial advisor has over twenty three years experience in financial planning. He provides independent financial advice to clients in Bournemouth, Poole, Dorchester, Christchurch and the surrounding areas. The initial meeting with Karl Ward is free of charge and can be arranged at a location and time to suit the client.